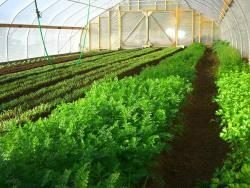 We offer a diverse array of sustainably grown vegetables, baby ginger, herbs, small fruits, and flowers. Find our produce at the Greenfield Farmers’ Market, through our CSA, or visit our farm stand, open May through November. 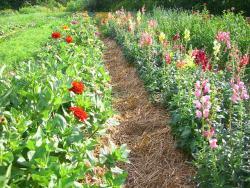 Beginning in May we have a big selection of organically grown vegetable, herb, and flower starts for your garden. Find more information on our website. CSA shares are distributed for 20 weeks from the first week in June until mid-October. One size shares cost $450 for the season. Weekly cost is $28.75, but the value of produce received is $30-$55 for most weeks. Distribution is at the farm on Thursdays from 3:30-6:00 or at the Greenfield Farmer’s Market on Saturdays from 8:00-12:30. Members fill their bag with a large selection of non-certified organic produce of their choosing. Every week sees a new item and includes salad greens plus main meal items. Pick your own flowers, herbs, etc.